Each report featured five to six innovative programs that used NEH funding to build communities. In addition to light refreshments and the reports, guests from congressional offices, universities, the National Humanities Alliance (NHA), the American Alliance of Museums (AAM), and the Washington Internships for Native Students program were treated to a short informational video that highlighted four of the programs featured in the reports. 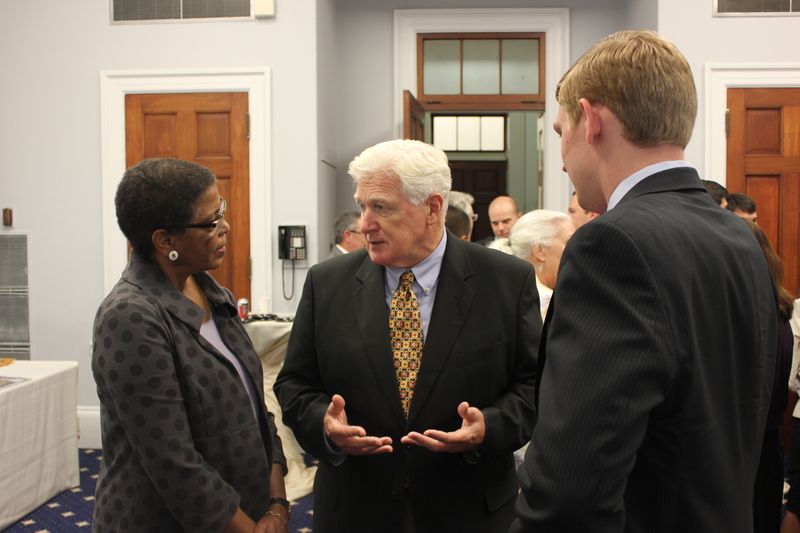 NEH Acting Chairwoman Carole Watson, Representative Jim Moran, and Jesse Reisling at the event. NEH Acting Chairwoman Carole Watson introduced the reports and the speakers. Congressman David Price and Congressman Tom Petri, both chairs of the Humanities Caucus, stressed the importance of the humanities while simultaneously discussing the mission of their congressional caucus. Jesse Reisling, founder of the Operation Opportunity program featured in the Veterans Report, spoke on the instrumental role of the humanities in veterans’ transition back into civilian life. Congresswoman Beatty McCollum spoke of her district’s diverse Native American communities and praised the work of the Bdote Memory Map, one of the many projects highlighted in the Native American report. Congressman Jim Moran also stopped by the event. Guests mingled with NEH staff and perused through the reports as well as Humanities Magazines and other NEH products. The Reaching Rural Communities report features six projects and a section on assisting potential grantees—an important resource for grant coordinators in congressional offices. One of the highlighted projects was the Normal Rockwell Museum, which is the Berkshire’s most visited tourist attraction. With NEH funding, the Museum was able to digitize and archive many of the American painter’s personal tapes and written works. The Preserving Native American History report, in addition to the Assisting Potential Grantees section, includes five projects that highlight the preservation of Native American culture. The NEH was lucky enough to have a copy of the Klallam Dictionary, a featured project, at the event. The Klallam Dictionary & Electronic Text Archive was made possible by a Documenting Endangered Languages Grant to preserve the dying Klallam language. The Engaging Youth report highlights 7 programs including the Prime Time Family Reading Time program. The Prime Time Family Reading Time program is an initiative from the Louisiana Endowment for the Humanities, an NEH-funded state humanities council. The program combines storytelling and discussion in one 90-minute session per week for 6 to 8 weeks. The Supporting Veterans report includes six programs, one of which is the Literature and Medicine program. The program creates a book club for doctors, nurses, and staff at Veterans Affairs Hospitals and engages them in conversations about their role in patient’s life. The program resulted in a reported 82% increase in empathy of patients. The program is now featured in 14 states nationwide.